The Pot Belly Deli (or PBD, as it’s affectionately known) has a casual atmosphere and truly incredible food. Their specialty? PBD is known for their unique take on breakfast treats. The ‘grilled muffin’ is a warm, buttery masterclass on how breakfast should be served. Definitely worth a try! Looking for an authentic slice of New York-style pizza south of the Mason-Dixon line? Todaros is the only place to go. In addition to a full pizza menu, they serve a variety of other pizza-parlor specials. The garlic knots are a real standout. Make sure to swing by on Wednesdays for dollar-slice night from 6 -11 PM. Searching for reasonably priced southern comfort food? There’s nothing more authentic than Paws, a diner that serves down-home country cooking. Here, you’ll find classic staples like fried okra, chicken-fried steak, and plenty of other southern favorites. Always a classic, the Clemson location reopened this past summer. Their extensive list of pizzas and salads are sure to satisfy any palate. Our recommendation? Try the pizza, the crust is out of this world! El Jimador, or ‘El Jim’ as it’s known to Clemson students, is one of the best places to get Mexican food in the area. The entire menu is fantastic, but they’ve got especially great vegetarian options, that would appeal to veggie-only eaters, and meat-eaters alike. A Clemson classic that you cannot miss, especially on game days. Esso serves up classic southern food with a hefty dose of Clemson culture. It’s one of the top sports bars in the country and rose to fame in the 1950s when it was the only place that you could go in Clemson to sit down and have a beer. Insider tip: be sure to try the fried pickles. Right on Clemson’s main street, Loose Change is convenient for lunch after classes or a few drinks on Saturday night. They’ve got fantastic bar food and drink specials (think Taco Tuesday), but are most famous for their décor: the inside is completely covered in dollar bills. 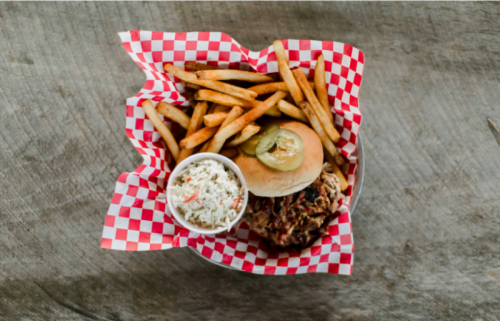 A little further off the beaten path, but there’s nothing quite like The Smokin’ Pig, which boasts some of the best barbeque in the southeast. The South Carolina pork barbeque is a favorite, but don’t forget about the sides: from macaroni and cheese to sweet potato casserole, this joint is sure to leave you stuffed, but wishing you could try more southern classics. One of Clemson’s more upscale establishments, Blue Heron is a classic date night spot. Their menu has a variety of options, from sushi to melt-in-your-mouth steaks. Try the oysters if you’re looking for a real knockout dish. Pixie and Bills is regarded as Clemson’s original fine dining establishment— the perfect place to take that extra-special someone or to bring the parents when they come in from out of town. They’ve got a varied menu that offers an upscale twist to classic southern favorites. Ready to try these top 10 restaurants in Clemson SC? With these favorite spots, you’re sure to have your plate filled for the rest of the semester!